The Pali Canon — The Contemplative Life. I'm about to start a short series on the Buddhist Eightfold Noble Path, but before that, I'd like to do a post on the Pali Canon. As I've mentioned before, Buddhism has always seemed incredibly diverse to me. Every time I read a new Buddhist author, it almost seems like I have to pick up a whole new vocabulary, and engage in a whole new set of concepts. Sure, there seem to be some constants – the Four Noble Truths and Eightfold Noble Path stand out here – but I find myself wondering if even those "basics" are as core to the tradition as some authors make it seem. My hunch is that even saying that "the Buddha's teaching surrounds the Four Truths and Eightfold Path" may be a gross oversimplification. That's just my hunch. Part of why I believe Buddhist teaching seems to be so diverse is that the primary set of Scriptures (at least for Theravada and what may be called "Western" Buddhism), the Pali Canon, is absolutely massive. Estimates vary, and page counts depend on the translation (and page size), but you are talking about a group of writings that is probably more than 10 times the length of the Hebrew and Christian Scriptures, perhaps 15,000 - 20,000 pages of printed text. 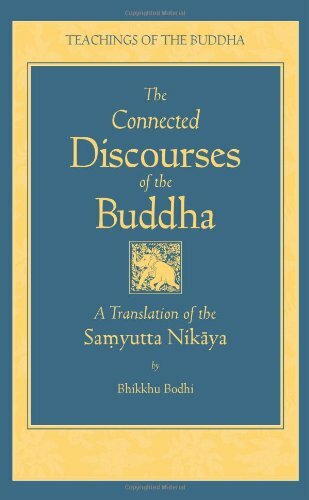 To get a feel, look at this translation of the Samyutta Nikaya, which is one of the five subdivisions of the Sutta Pitaka – itself only one of the three divisions of the entire Pali Canon. The translation of the Samyutta Nikaya itself is almost 2,000 pages. That is a ton of text to draw from. On top of that, it doesn't seem the each individual sutra is necessarily connected to what surrounds it. It's more just a list of sayings/discourses, mostly grouped simply by the length of the discourse (i.e. "the long discourses," "the middle length discourses," "the short discourses"), than a connected narrative. The Canon is separated into three "baskets" (sometimes referred to as the Tipitaka): the Vinaya Pitaka consisting mainly of rules for monks; the Sutta Pitaka consisting of basic teachings of the Buddha in discourse form; and the Abhidhamma Pitaka which contains systematic Buddhist philosophy and is sometimes referred to as the "higher dhamma" (i.e. it is more esoteric, philosophical, and specialized teaching). Each basket is also further separated into smaller subdivisions. What the nature of the Pali Canon leads to, it seems to me, is the potential to choose a select group of sutras, and form a "Buddhist teaching" based on them. Teacher A's analysis of what is "core" to all these texts may be vastly different than the view of Teacher B. Hence the emphasis on lineage within Buddhism (i.e. I follow the Dhamma as taught by Teacher X who is of the ____lineage.). This dynamic is true of all religion. People read the Christian, Jewish, and Muslim Scriptures and come up with different theologies. But it seems to me that Buddhism is more open to a huge diversity of teaching due to the nature of its Scriptures. In Christianity, the recorded teaching of Jesus is contained in the four Gospels – maybe 100 pages of text. In Buddhism, the recorded teaching of Siddhartha Guatama is contained in 20,000.